Why it’s important for you to support the OB Planning Board. OB Planning Board in action. At times the local planning committee for Ocean Beach acts in relative obscurity. Not by choice, however, for the individuals who serve on the 14-member Board want all the attention they can get. 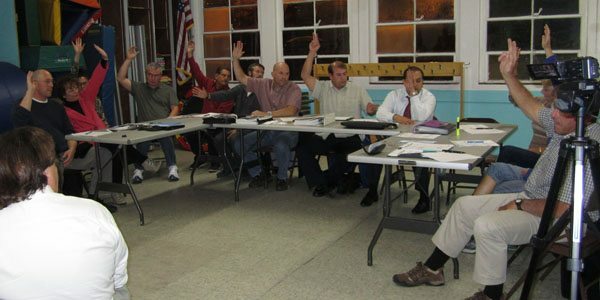 And rightly so – for the Board – which holds two open meetings every month – is really the ONLY publicly-elected body in OB, and is the expression of the people’s will in our little village. It’s annual election – which is this Tuesday, March 15th – is open to every resident, property owner or businessperson in Ocean Beach. In contrast, the Ocean Beach Town Council only allows its tightly-controlled membership to vote in its elections – which critics assert are at times rigged to ensure a crony-like atmosphere to prevail, plus it holds one of its monthly meetings in secret. The good people on the Council are dominated by those who feel it is their own sandbox. The OB Mainstreet Association elections, of course, are for its business members only – which makes a lot of sense. By law and design, the Planning Board advises the City on land use and urban planning issues as it has the authority to approve or disapprove construction projects which fall under its purview. It’s decisions on building can be appealed and so, in that sense, its decisions are not always the final say, but they are very persuasive. It also acts as a public forum on community issues. Recently, it listened to both sides on the issue of the Longbranch Torrey Pine – which the City wanted to cut down, and has been the sounding board for residents upset about the move by the OB VFW Post into a location in southern OB. And on this Wednesday, March 16th, the OB Planning Board is holding a Special Meeting on the proposal before the San Diego City Council regarding Medical Marijuana Land Use Code Amendments and changes made by the Task Force in how medical marijuana dispensaries are permitted in the City’s land development code and how they affect Ocean Beach. So, because it makes decisions on planning issues and is a genuine community forum, it is very important for OBcians to support the Board, attend its meetings, and vote in its elections. The Board’s history and efforts by the City to curtail its power also make it imperative for community members and businesses to shore it up. The OB Planning Board was founded in 1976 in response to a very real crisis in Ocean Beach. Back during the last quarter of the Twentieth Century in the early Seventies, before the 30 foot height limit was established, before the California Coastal Commission was created, developers ran amuck in OB and other areas. They were able to quickly build 2 and 3 story boxes called apartments, cut the curbs at will – eliminating parking, build out to the edges of their properties – vanquishing side yards, set-backs and views, which together created increased population, congestion, traffic, pollution and a general lowering of the quality of life for residents – which like today, are mostly tenants. And importantly, all planning decisions were made by the elite rich and powerful who reigned over the community like little lords and ladies attempting to move the serfs and peasant around as the elite pleased. The urban planning crisis of the early 1970’s that engulfed the coast was finally met by a grassroots activism that rose up in opposition to the land grabs of the well-connected. The 30 foot height limitation was established by a citizens’ movement that placed it on the ballot for the City of San Diego. 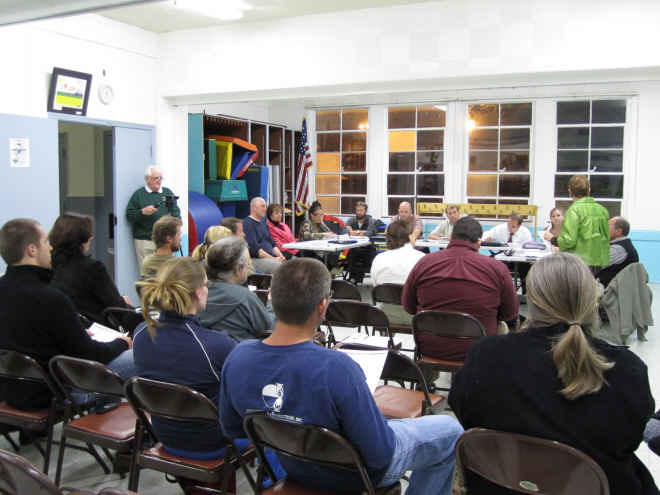 And in OB, townspeople organized themselves into various groups like the OB Community Planning Group, and after several months of working with local merchants, professionals and the Town Council, the collaborative effort generated so much support from Ocean Beach, that the City and Mayor were forced to recognize their efforts and allowed the creation of the Planning Board. Seven districts were carved out of OB, two members to represent each district were set, and the first election to the Board drew thousands of residents, property-owners and businesses to vote in its historic 1976 plebiscite. The OB Planning Board thus became the very first, democratically-elected planning committee in San Diego and in fact, in all California. Over the years, other communities in San Diego have modeled their own planning committees on the Ocean Beach experiment. And today, it’s recognized as the grand-parent of all planning boards. Because today’s Board was created in response to a planning crisis and was formed by the grassroots, it stands as a very real people’s institution and model, and it deserves the community’s involvement, interest, support – and protection. Protection from what? – you might ask. From day one, the City’s support of the Board has been ambivalent at best, despite the Board’s codification within the San Diego Municipal Code. And at times, it has appeared that the City wants to undermine the scope and breadth of the Board’s authority. One way the City has done this is to insist on “re-writes” or “updates” of the Ocean Beach Precise Plan – the guiding document for the Board over the years. Critics see these attempts as efforts to water-down one of the most “green” and innovative design plans under the City’s rubric. In fact, there is an update process going on currently involving community-minded volunteers who have tried to respond to the City’s insistence for conformity to the over-all design plan of the entire City. This update will soon be made public. Another threat comes from the economic downturn the City and the entire country has experienced over the last several years. With less money around, there is less building going on in OB and elsewhere. With less building, there are fewer numbers of projects that go before the Board. Sometimes recently, there is virtually nothing on the Board’s agenda, and some meetings have even been canceled due to the lack of projects to review. This has created an absence of interest in the Board itself. A falling concern or interest in the Board has translated into fewer numbers of candidates for the vacate seats on the Board. And if the City believes there is no more interest in the OB Planning Board, it has the power to simply dismantle it. This cannot be allowed to happen, for it would throw away a third of a century of urban planning by our community. Another way the City undermines the OB Planning Board is in how the different City departments ignore it. The recent experience we had in saving the Torrey Pine on Longbranch Avenue is a good example of this. Until community activists trying to save the tree made an agreement with the City’s arborists and Street Division managers to come before the Board for a decision and use it as a sounding board, the forum the Board provides would have been passed up, despite declarations by City staff to the contrary. Any decision involving land use, recreation, infrastructure, planning, public right of way, trees, streets and their maintenance needs to come before the Board – for at least an advisory opinion by, of and from the community. This doesn’t happen all that much. Yes, City reps appear at the Board – as they do at the OB Town Council and Mainstreet meetings – but usually it’s after a decision has been made. In fact, more City service personnel use the Town Council – despite its unrepresentative nature – to make announcements about decisions that affect us all. So, OBcians need to support our OB Planners. We need to increase the issues that come before it and expand the forum the Board provides. We need to be involved in its elections, its special meetings, learn its history – and continue to make up the volunteers who staff the seats, its sub-committees – and most importantly, its future. Vote this Tuesday, March 15th, from 4 to 7pm at the OB Rec Center, 4726 Santa Monica Ave. Attend the Special Meeting on Medical Marijuana Proposal, March 16th, at 6:30 pm also at the Rec Center. Thank you! You very clearly explained the importance of the Planning Board. I have to say, the relationship between all the various entities here in OB has confused me at times. Well when you win an election 10 votes to 8 in any election, it sure don’t show a lot of interest by the people. Dave, that’s true, and that is why I wrote this post – to increase the interest and knowledge about the importance of the Planning Board. Time for you to be appointed to a seat, dude! Thanks Frank, it was an experience for sure. Thanks, Frank. As someone who has served on the OBPB for the last 3 years, I can speak firsthand about what you have just described. Above all else, OB is a very special community in very large part due to the civic engagement of its citizens over a 40-year period. It would absolutely be a very different, less funky and less unique place if not for the efforts of many community members who worked hard to help keep it this way. Not everyone will agree on everything, and many tough decisions are made in the name of land use and development, but anyone who cares about the community and wants to help “keep OB OB” should care about the Ocean Beach Planning Board. It is one of the primary vehicles through which the community gets to have a say in what its future is going to be like. Great points Frank and a great call to action. OBcians need to get involved in the decision making process and the first step is to elect representatives. Although the “revolution wasn’t televised”, I heard from some people over the weekend that the appeal hearing last Thursday was denied….therefore, effectively raising the FAR in OB and releasing the 25% requirement for a garage in the RM2-4 zone of OB… effectively raising the FAR by 1/4. This meeting was not on the City’s 24 TV or streaming because there was a special meeting of a conflicting City Council committee at the same time. Therefore, there isn’t any video to watch. I heard that OBPB was represented though. And also heard that the City Staffer misquoted a vote of the Planning Board as well. Here come the bulldozers…. Deadline for write-in packages is midnight tonight if I understand the applicant package correctly and I haven’t heard any updates since the last OBPB meeting where there were only 4 candidates announced for the 7 positions. Opponents of the pot clinics complain that they attract a host of criminal activity to the neighborhoods, including robberies. But a report that Beck recently had the department generate looking at citywide robberies in 2009 found that simply wasn’t the case. Shane – You served on the OBPB a few years back. No commentary from you on the elections? I’d just second your call for more people to get involved. I really enjoyed my time on the board… it’s a great way to get involved in the community, get experience as a member of a board, and get an entry-level taste of what it feels like to be an elected representative. If there’s someone out there who is on the fence about whether to turn their name in a write-in before midnight tonight, I’d say go for it. So, Frank, just how can we reach the current individuals who live here & enlist their support? seems to me, lately, interest from those who cherish our village atmosphere are dwindling in numbers. Don’t get me wrong, those that come to these OBPB meetings and speak up are doing just that and I’m grateful to be a part of it. it’s just that I think a crowd of 100’s would yield more results than a crowd of >10. how do we get people to care? or show up? or even realize what’s at stake?